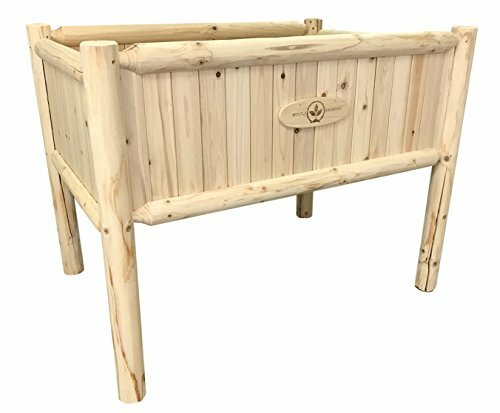 This raised garden planter is a fantastic addition to any patio, garden, deck, or apartment. It makes gardening easy and limits your need to bend over while gardening! Why you'll love it: This garden bed brings the simple joys of gardening to any location without the need to dig up your yard or landscaping. It also gets you outside and enjoying nature. Perfect for container gardening, patios, balconies, or even indoors! When you grow your own vegetables, you save money and they taste better! Specially designed: It's the perfect height for adults. We tested multiple heights during the design phase to make sure we got this right. The raised bed keeps fruits and vegetables out of reach from many pests and provides a growing area large enough for multiple different types of produce. We've provided you with 9" of soil depth below the rail and an elegant design that looks great in any environment. From the Manufacturer: We create products that get people outside and enjoying a small piece of nature. We designed this planter so that you can have your garden regardless of where you live.